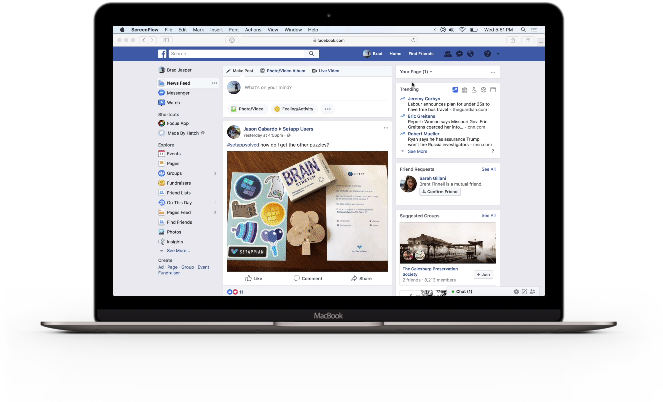 Reclaim your productivity by blocking distracting sites and applications, like Facebook and Fortnite. Stay on task and in flow to accomplish your best work! Facebook? Twitter? Reddit? Social media services are great, but getting stuff done can be hard when they're one click away. Wouldn't it be great if there was a way to quickly create your ideal work environment on your computer? 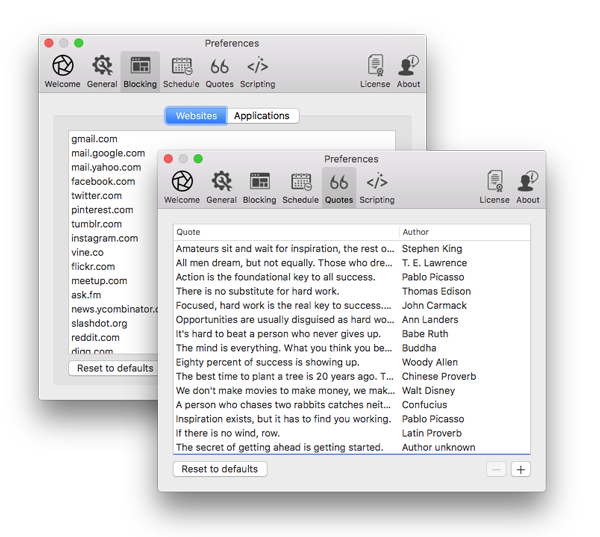 Focus is a Mac app that sits in your menu-bar and helps you find your zen. One click creates your optimal work environment. Focus is a website blocker that can block websites with precision in all major web browsers (like Google Chrome, Safari, Firefox). This makes it easy to block sites like an entire domain or just the homepage. You can even use the powerful allowed sites (whitelist) feature to block the entire Internet (or just allow a few pages). Focus is also a powerful application blocker and can block applications on your computer like Slack, Skype or distracting games like Fortnite. 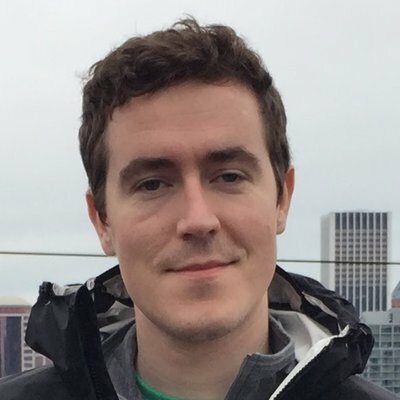 Blocklists work at the operating system level don't require a browser extension to work—blocking even works in Incognito mode! Getting back on track after you're distracted can be tricky, which is why Focus shows an inspirational quote to put you back in a productive mindset. 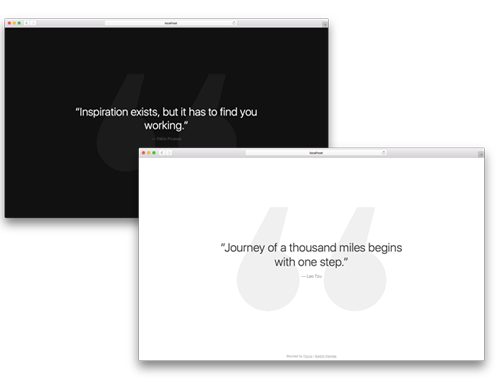 Dozens of inspiring quotes are shipped by default, but you can always customize and add your own to personalize your motivation. Be more productive by scheduling your productivity ahead of time and building a habit. 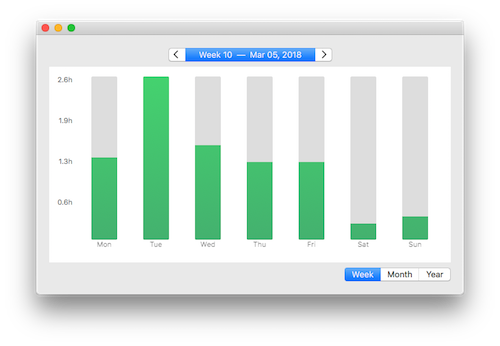 Focus makes it easy to setup daily, weekly or weekend schedules (and to enforce them). If schedules aren't your thing, Focus has a pomodoro timer, a productivity technique of breaking work into small time limits to improve flow and mental agility. And don't worry, if you need a break, Focus can allow up to a certain amount of time every day. Over time, using Focus this way helps you build your discipline and self control. Sometimes procrastination creeps in and we need some extra help staying on task. Focus can enforce schedules and timers with a lock mode, which means when they're running, they cannot be stopped. Focus also offers password protection, requiring a password to change any preferences. This is for use with a trusted friend. Be careful, these modes once engaged cannot be stopped! Keep up with your productivity to ensure you're on track with Statistics. Track daily, weekly, monthly and yearly Focus sessions so you always know when you've been productive. Build a streak, and then keep it going! 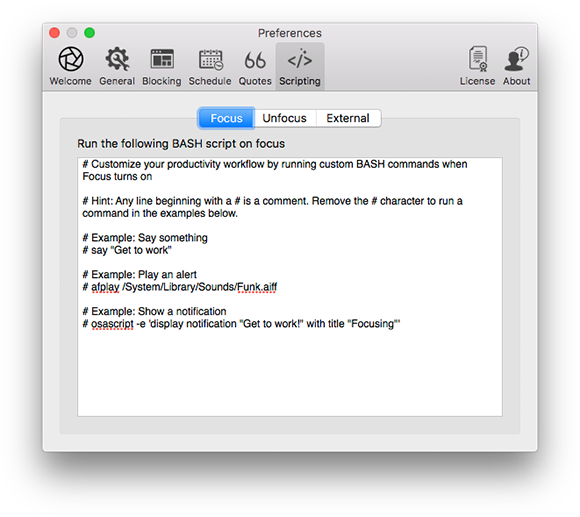 Focus has full BASH scripting support, which means it also supports your favorite programming language. Craft the productivity routine of your dreams, like automatically setting away status on Slack/Skype or setting Do Not Disturb mode on your Mac. It's even possible to call Focus from other applications, creating flexible productivity routines. Learn more about scripting with Focus. After a long Focus session, take a break. 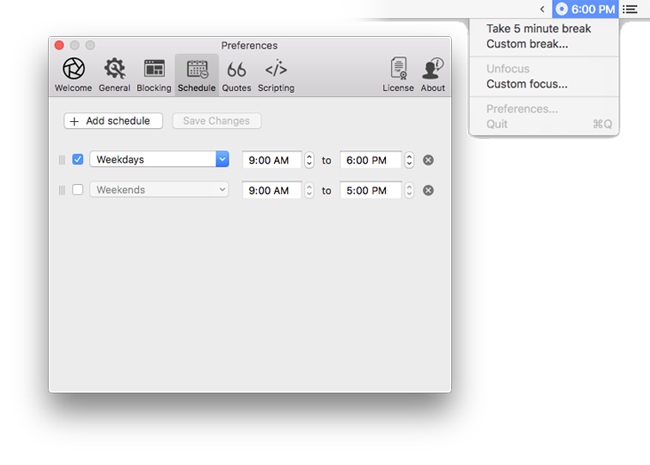 Breaks are configurable in the preferences and can be disabled entirely. Quickly add and remove websites to Focus by dragging and dropping them onto the menubar icon. Instantly get in the zone from any application with a global hotkey you can configure (by default it's control+option+command+f). Focus supports all networks, including complex ones you may find at work (like proxies or VPNs). Powerful URL Blocking allows you to block exactly what you want, from a page, to an entire website or the entire Internet itself. Focus never sends your browsing data to our servers, everything is self-contained on your Mac. Rest easy knowing your privacy is safe. Focus can't force you to work and that's not its goal. 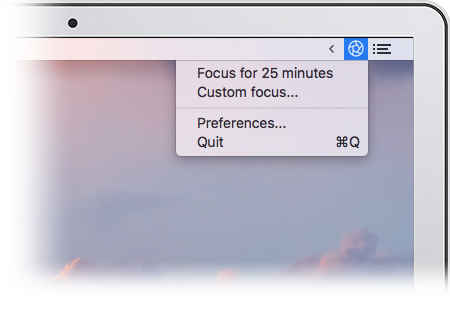 Focus helps you create your ideal environment with 1-click, so you can get high quality work done. When distractions pop-up, Focus is here to block them and set you back on track! Watch a quick video on how Focus works. 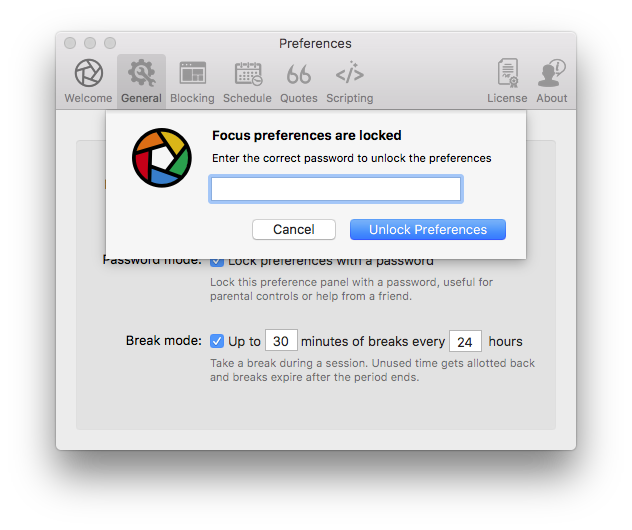 Focus is the best way to block distracting websites and apps, get in the zone and finally become more productive. It starts at $19 with a fully featured 7-day trial. Focus is built by Brad Jasper (that's me 👋)—I'm building high quality software that improves your productivity and creativity. Focus supports me full-time, thanks for supporting indie development! Enter your email below to receive a download link for Focus. You'll be able to begin your trial immediately and start improving your productivity!